Pros: Even if a website is super relevant to its audience, and the site-visitor is interested in what you're offering, most site-visitors give you under 10 seconds before they bounce off your page (either due to lack of interest or the next cat video or article). Novocall's behavioral widget enables you to capture that audience by giving the site visitor an opportunity to connect them with the site-owner / sales team and thus reduce lost sales opportunities. The visitor can choose to connect instantly or even schedule a call. The product is super easy to configure and to use. It creates a professional experience. What I like is the round robin feature that allows me to have other members of my team available to take calls in case I am not around. Cons: I haven't really faced any issues in using Novocall so far. One minor gripe was that since we have a globally distributed team, with folks living in different time zones, we wanted to different availability hours for each person. The tool does not have the option to set a different time zone for them, yet. However, the support team has made note of this feature request and will look at implementing it if there's enough demand. Overall: The product is stable and packed with good features and has a highly supportive team - They resolve all issues over their intercom chat. Novocall has certainly made a difference in our sales results. We have tested its widget on specific pages of our site and run email campaigns that direct recipients to that page. The number of calls and sales we have subsequently converted after that have more than made up for our investment in Novocall. Pros: It gives the ability for my online customers to easily get in touch with myself or my staff. We use FAQs and bots but when people shop online, they often have questions that need immediate personal one-on-one answers and Novocall gives an instant solution that FAQs or bots just can't do. On the back end, the ability to easily setup, customize, add other users was a great experience. Cons: I use another type of software similar to Novocall. It would be nice if after the call customers would receive a notification by sms, email or right through the app to leave a review for our business or just a rating for feedback of the call. But I'm sure they working on this. I use Shopify, and while installation was a fairly easy (just insert a line of code), it would be nice if there's a Shopify integration. But I think this is on Novocall's roadmap as are calendar integrations and more. Overall: I set up Novocall the very first day I got it. It was great. After using it for a couple days I started getting more customer to speak with and made more sales. I ended up upgrading because the proof was there and it worked. Using the Novocall app my sales have increased and in the first two months alone the amount of sales it brought in paid for the Novocall app 10x over. Thanks JJ and everyone at Novocall. Please keep improving and innovating. Pros: It is incredibly easy to set up! I did have some minor question and they were quickly addressed by a real friendly support team. For a relatively new product, the feature set is amazing. Novall is very stable and I have not encountered any glitches in the system. Very excited to have a good alternative for CallPage, which unfortunately has let me down a couple of times. Now in the process of switching my whole setup to Novocall! Definitely recommend. Try it yourself. Cons: The roadmap is very ambitious. This is not a negative point really. I do expect that their team will roll out new functionality in a fashionable time without disrupting the quality of the service. But that is something only the future will tell. Overall: Getting my customers to get in touch with me without them needing to dial a number or paying for the call is obviously what Novocall does. It does this very well. My experiences so far are only superb. Very excited about the upcoming features mentioned in the roadmap. Pros: I like that the widget is easy to set up and configure. i like the idea that I can place a really big CALL TO ACTION (call us...literally) on my site. Cons: I asked a customer service question during regular US Business hours and I was told they were off line. The question was "Can I set up more than one widget". The answer I got back, by email 8 hours later was YES. While that technically was the answer, I don't know how to do it. So, my bad for asking, maybe a poor question. But their bad for not anticipating my real need...the HOW to set up a second wdiget. Overall: See the information above about my customer service experience. I purchased this from App Sumo for a one time price--based on the customer service I have received thus far I am not sure that I would become a monthly subscriber. Hi David, I'm sorry for the poor support reply. I've dropped you more information answering your question and let me reassure you that it should not happen again. Also, reviewing our support protocols and guidelines now. Thanks for telling us! Pros: Novocall has helped me to overcome the problem of losing potential customers after they land on my website. It was also super easy to configure across all 3 websites that i have. Cons: I have not faced any issues yet at the moment. job in streamlining my business processes and more importantly, to convert leads. At the same time, the interface is easy to use and the customer service is helpful. I would highly recommend Novocall to all who wish to have a seamless experience in managing calls and leads! Pros: Super easy to install/add to your website, the directions provided by Novocall are fantastic. The instant call feature allows for a professional telecommunications image without requiring a landline or over advertising of a mobile number which we all knows leads to annoying marketing calls! I particularly enjoy the pop up option when a user starts to navigate away from your site or a certain page. Cons: The only limitation is the rigidness of options. It would be great to be able to deactivate certain features, or have a little more flexibility on pop up timing, widget location. But that's all minor stuff. 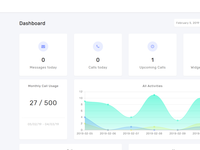 The only major limitation is lack of integration with your existing calendar, which means you could get a missed call when you are unavailable, making for a poor user experience. Overall: Overall it's a simple yet highly effective tool that can take your website to the next level. Pros: The app is really clean and customizable. The platform offers the flexibility to customize every aspect of the widget and you can create as many widgets as you want. You can also trigger the popup using different visitor's behaviors. You will be able to integrate it with slack and knows about the call even before the call comes in! Cons: You don't have the option to have unlimited calls, but, none of their competitors have that option either. Pros: I am a solo entrepreneur who runs a small ecommerce shop that sales internationally. While other online chat tools are great, many times I am not in front of the computer or paying attention to the chat window. Then Novocall comes handy, because customer can just get a free call from any country in the world, and I am alerted by phone of the call, so I can easyly noticed. Also it looks good to have in the website as the icon looks very professional, it shows the country flag to each sutomer (so states that we serve to that country) and it is highly customizable. Also has the option to send a written message, call me later option (schedule a call for when I will be available), or to contact via whatsapp. Cons: My overall impression is good. At the same time, I must say that I lack data of how people feel about that "call me option". Maybe I should run some AB test to be able to say. I do not get too much calls to tell the truth. Overall: It has allowed me to close some sales that otherwise would be difficult to close. For example people from other countries that did not really trust a website from other continent, or people wish issues on the check out process. Pros: Novocall widget was very easy to customize. It did not take more than 5 minutes for me to set up this widget up and running. Only a little code that can be inserted in any webpage for installation. They have a clear tutorial for any instruction. Widget looks very beautiful on one corner of the website. I was able to test it properly and voice quality was so good. It is perfect for any niche idea business website. Cons: There are some options like disabling automatic call scheduling that cannot be disabled, however, I heard that the team is working on those. Also, call dialing in many countries are still not available for Nonvocal. I like to see many more countries in the list. Overall: I am very happy got a very good deal. Installed it and checked it. Voice quality was good. It is definitely worth for money. Pros: I love my customer can be called back without spending money. The setting up is very easy. I love to have the possibility to receive customers' telephone number because I like to contact them through Whatsapp. I love Whatsapp function in Novocall. Cons: I 'd like to choose when and where chat box appear, not automatically when the web page is opened. I want to insert 3 different buttons on my web page: call me, I recall you, write an SMS and I'd like that chat box could appear only when the customer clicks onto each button, and chat box is set up for that specific function...so if click onto I RECALL YOU button chat box appear only with that function, if click onto SEND SMS button chat box appear only with that function. Overall: Even if I've just started right now some new customers contact me! Could I have invested money better? No way! Pros: First of all support is exceptional. They listen and they develop this tool really fast. Cons: I'd love to see Matomo Analytics integration just the same way as Google Analytics is implemented. From the developer's view it's really easy. Events are handled the same way, just event name differs. Overall: I'm not sure if there is any better way to invest your money as far as customer service and contact with potential clients is concerned. Cons: None that I can find at the moment. I guess if I was to be picky, I would maybe have a better price structure for the additional call credits. (Buy more and get extra) - it gives the user to spend more and buy in bulk. Overall: It has been great, their support is very fast and helpful, they have an awesome FB group where you can find all the updates to the app along with collaborate with other like minded people. Overall the app and everything that comes with it has been top notch quality! Pros: It makes connecting to a customer easy and for the customer to reach me for free will reduce their barrier to contact me. If you own multiple businesses, I like the fact that you can create diff accounts to track different customers from each of my business and assign it to any of my staff. I can also set time limits to avoid international customers calling me at odd hours and I can still return them a call at their requested time. Overall: I like that fact that it will allow customers to contact me just with a simple click and i can allocate this links to wherever I want them to be. * Good customization options with agents, numbers. Cons: * I wish there was a way to make outbound calls from the software dashboard itself. * I don't want to show Novocall message or a branding , but upgrade price is high compare to its competitors. Overall: In my opinion, it is a perfect software for any person who would like to enable their customers to make calls. It has saved us lot of time to send them a zoom or skype link as customer prefer phone calls in general. Pros: Novocall is the best for my business. Find potential customers who show interest in your product or services. It can help businesses increase sales! Cons: No cons with Novocall. It is the perfect solution for your business! Overall: Novocall is the best! Pros: Easy to use and to deploy to a sales team. You can implement the solution in few clicks on your website and you are ready to convert visitors into leads. That definitely helps to increase your sales cycle time. Pros: It's an easy to use tool that connects on one side the customer support/ sales team in an effective way with the visitor from the website. Quite convenient is the feature of implementing the daily working hours of the free person who can handle the calls. Very comfortable to implement to the website. Cons: I wish the tool gives the possibility to get the visitors name by asking for it in an additional pop up so the customer support knows with whom to speak before answering the call. Some features need upgrades to be unlocked - like the amount of calls per month. Pros: What I like best about Novocall Is the ability for my website visitors to schedule a call back with me. When we aren't available we still have the opportunity to connect with people who are considering our services. Cons: I can't think of anything that I don't like about this product. It truly was designed with conversations in mind. Overall: The first day that we installed Novocall on our website, which was really easy by the way, we had people scheduled calls with us. From those calls we actually had someone purchased tickets to our event that brought in over $1000 of revenue. I would highly recommend this tool to everyone. Pros: I like the ease of use of the system to allow people to connect to us easily and fast. Its a really cost effective solution for business that wants quick answer. Cons: I have experience people having typo error and in the end the call was connected to someone who did not submit the info through the form. This can cause unwanted nunisance to receiver. Worst case scenario is, someone purposely submit false number to request for call and not only make our company a spam but caused us to get into trouble with the law for spam. Overall: Overall experience is great so far! Pros: Ease of use , interface and analytics. Cons: Cant say anything yet, so far it has been a great experience. Pros: Adding the software to my website was simple and took around 15 minutes. The very next day, I received a call directly from the website and turned the caller into a customer. It doesn't matter what industry you are in, even eCommerce, some customers like to speak with someone and Novocall makes it so simple for them. Overall: Great product, great support and development. Pros: This widget was so easy to install on our site. It looks great and works flawlessly. This feature pays for itself with just one extra sale per month but we know we're getting much more than that! I just love how it turns passive visitors into actual hot leads so easily. Pros: I liked the call back capability of this software since many of our clients live in different timezones and we can't take their calls on the spot but we can provide a call number on our website which is great. Cons: That not all countries were supported but they are working on fixing that. Overall: We added the widgit to our landing page and want to use it for scheduling demos with potential leads. We debranded the widgit as well which is awesome. It's a service that Novocall provides for a small upgrade. Get your leads on the phone with ease! Pros: One of the hardest parts of lead capture is how passive it can be. A visitor comes to your site and surely has lots of questions. But if there isn't anyone there to help answer, that's a big problem and they're probably bounce. With NovoCall, you give new leads the option to immediately hop on a call to get their questions answered and hopefully convert them into a customer or client. Cons: The installation and setup can take a bit of time, especially if you're not familiar with tools like this. But with a bit of time you can get it up and running on your site without much of a hassle. 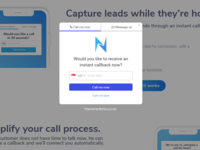 Overall: We've worked with Novocall to get it setup on a handful of customers sites, including lawyers and other high ticket businesses that really a way to get leads on the phone so they can close the sale. So far it's been a great tool to have. Very easy to setup, great support! Pros: Great set of functionalities, very easy to setup and to get it up and running on my website. Great support team, very fast response. Cons: Would be nice to be able to customize the text message that it sent to remove the Novocall branding or if the Novocall branding has to be there then replace it with a partner/affiliate link. Overall: So far so good! It's been up on my website for a few weeks now. It's a great way to provide another avenue for customers to easily reach you. Pros: I liked how easy it was to get setup and begin running on my website. Cons: For us, it just didnt seem to generate any extra calls. Ive seen these tools work great in the past. The other issue was the intergration asepect and being able to book calls into my calander was a big feature I wish they had. Overall: Overall I loved it. Hoping to come back to it one day but in the meantime I will keep recomneding friends to it. Pros: - I liked the ease of installation and configuration. - Dashboard interface and very good usability. - Support of good quality. Overall: Overall the experience is very good. A very well built system and a staff open to suggestions. Congratulations Novocall! Pros: We really liked this tool as it's giving us an opportunity to connect with our clients as per their availability. Good call quality and no need of internet to get connected. Cons: I wish we could set the call duration or can decrease to 10 mins as standard call duration. Overall: We're quite impressed by this tool and it's certainly a must have tool for all the companies. Pros: Straight to the point contact option for website visitors. Phone calls are the #1 way we close sales in our company. Cons: Interface could be a bit more streamlined - would like to see custom styling options. Overall: The gap between inquisitive customers and personal service is always a challenge. Overall, Novocall has enabled us to close this gap significantly. Pros: 1. Team is fast to implement update / makes fixes. 2. The software is easily to implement on your site. 3. Big list of country you can get calls from. Cons: 1. Some features still need enhancement. 2. Integrations have to added to the platform. Overall: I have had chance to interact with the Novocall team and they are very responsive. Pros: I love how easy this makes it for clients to contact us form any where on our page. As opposed to putting a contact form own every page, instead, we can offer an immediate call back which seems more personal. Cons: Wish we could personalize the messages more for a branded and personal experience. Pros: Ease of use, ease of implementation. Easy lead capture, appointment setter and more! So many various ways t use it, if you get creative! Cons: The one default is not having the ability to brand emails for call confirmations, etc and no ability for 'sales rep' to get SMS notifications for scheduled call. Pros: As a longtime user of IVR software, I'm usually skeptical. But Novocall did a really good job of making an important task really easy to implement. If you have multiple locations, and want to connect the web pages for your multiple locations to their direct phone lines, Novocall makes it easy to do so by creating a new widget for each location. Cons: I would rather not display Novocall branding so prominently. And I wish there were more customization options for the widget. Overall: I think Novocall is a terrific solution for companies with multiple physical locations. The inability to set a call duration longer than 10 minutes is going to be a problem for some, so be aware of the limitation. Pros: It's ready to go out if the box. Easy to set up and use - there are so many creative ways to use this in your business. Pros: This has beyond a doubt improved our conversion rate. I am not sure if this is unique to Novocall or generically to the product category, but it is working! Cons: Our traditional contact-us is feeling lonely after implementing Novocall. Overall: We had a question and they replied back right away. Pros: Very easy to use. We set it up for our first time in about 5-7 minutes. Cons: At first we were a little confused about the text message part and how it worked but customer service is super responsive and explained everything. Overall: Amazing! We have it on several clients now and they love it. Cons: API and HTTP request functionality. Could use some more integrations of the bat. Overall: Good, pretty easy and straitforward. Pros: The support team has been quick and apt.Jj from support team has been always the point of contact for solving all the questions. Cons: Maybe, the design. but each time I had a problem I email the team. A couple of weeks later the features / requests was implemented. Must have for anyone that does customer callback. Pros: The team is absolutely amazing! The speed at which they upgrade and improve the product is remarkable. The support is top notch. New features get added regularly. Cons: I hope they add more countries and customization options. Cons: Nothing for cons since overall it works without any flaws at the moment. Overall: Being able to allow my possible customers to contact me easy or current customers. Pros: It's easy to set up and install, and Inlove how you can customize the colors to match your website. Cons: It'd be nice is the operator's (my) profile photo would show up on the pop up like it does when you click on the phone icon. Pros: I got really excited with this product, because, I immediately saw the benifit of schedualing callback for a strategy session. I can embed this in my website, have it handle the booking of 20min strategy sessions. It calls me, then calls prospect and connects us together. Cons: As per my use case, it really needs to be able to intergate with my google calendar. At the moment I am using webhooks and zapier to push appoinments to the calendar, but at risk of double booking with something else. Overall: This has been an amazing experience, and very excited about the future of this product. Pros: First of all, The APPSumo Deal was awesome and After that Continuous update from the Team. Cons: It is in early stage, So Couple of basic features are missing But they are providing continuoes update which is really good.